Welcome to week two of this 30 Day series on Unlocking the Bible, to uncover its truths for yourself. The Bible is our spiritual food, so this systematic study builds on the idea of food and nutrition. Last week we eased into the Bible with Breakfast Bible Time. We talked about Preparing yourself through rest and inviting God along; collecting the right Ingredients for Bible study; and a very simple Recipe for opening the Bible, breakfast style. Now it's time for lunch! When I pack a lunch for my kids to take to school, I make sure their lunch boxes are full of brain food to help them get the most out of their learning experience. 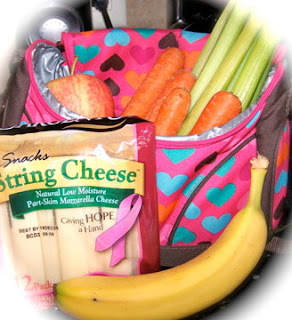 School day lunch usually consists of simple, elemental food such as carrots, celery, grapes, apples, ham cubes, cheese, whole grain crackers, and other similar items. This week we will open our Bible study Lunchbox and identify some elemental information that supports good Bible study nutrition. The Literary Lunchbox addresses literary questions such as who wrote the Bible, how the Bible came to be, types of literature in the Bible, and essential tools to enhance Bible study. The Bible is a collection of writings from about 40 people, written over the course of about 1500 years. Authors include Moses, Jeremiah, Matthew, Mark, Luke, John, and more. These authors ranged from highly educated, such as the Apostle Paul to menial laborers, such as Amos the farmer; from prophets such as Isaiah to royalty like King David (who wrote music, now some of the Psalms, while still a young shepherd). Usually the author of a book names himself at the beginning of the writing, in Chapter 1, Verse 1. You will notice a few exceptions, but that rule of thumb will reveal the answer most of the time. The anthology includes 66 books in two main categories: 39 books in the Old Testament and 27 in the New Testament. "Testament" is another name for "Covenant." The Testaments are the story of God's covenant with first his chosen people, the children of Israel (the Old), then with whomever asks to become his child (the New). All Scripture is inspired by God and is useful to teach us what is true and to make us realize what is wrong in our lives. It straightens us out and teaches us to do what is right (2 Timothy 3:16, NLT). The natural next question asks, who decided what's in the Bible? I will answer that tomorrow! Many thanks to those of you already reading and commenting on this series. You encourage me immensely with your kind words and support. Interesting. I LOVE Bible talk!